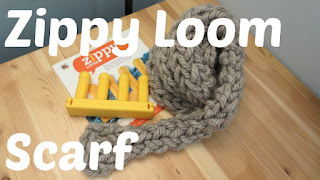 Today I'm here to show you how to make a VERY quick and easy scarf using the Zippy Loom! One of my lovely viewers asked about this so I went out and got one to try out. This knitting loom can be used by itself or in conjunction with other pieces that are available for purchase. I only have the 1 piece and it makes short order out of a scarf when combined with some super bulky yarn. For this one, I chose to use Red Heart Grande which is a wool/acrylic blend that's nice to work with. Onto the video!